NEFA Member, and local disc golfer Nate Spear is ‘Spear-Heading’ an effort to bring a new course to Framingham, MA. Here’s his story- please leave comments, share the article, and contact Nate with any aspect of follow-up you may have! Let’s bring disc golf to Framingham! When the wife and I decided to move last year to alleviate the 2+ hours of driving per day commuting to work, the hardest part ofmoving away from Haverhill was leaving my home course and the friends I had met there over the years at nearby Amesbury Pines. 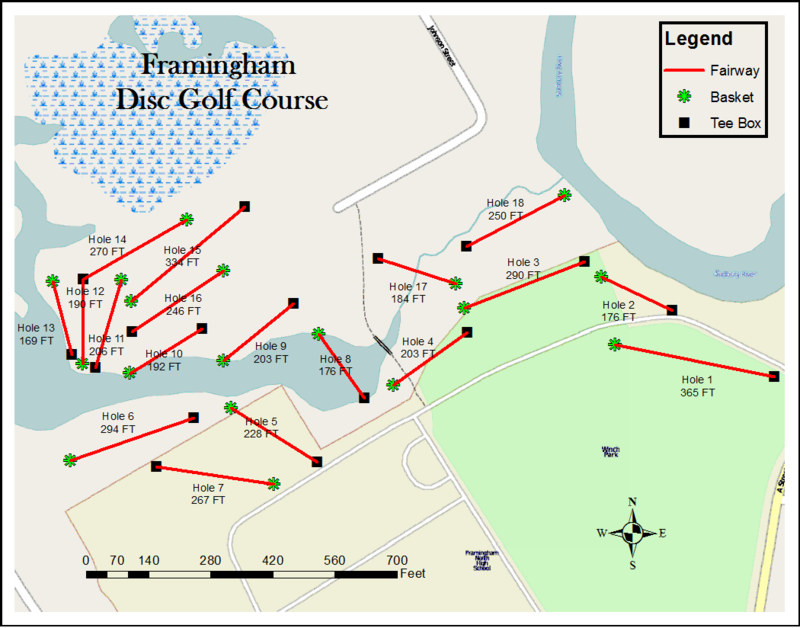 I knew that Framingham was the black hole of disc golf; there isn’t one course within 20 miles in any direction- so I decided to make it my goal to bring disc golf to the masses of the largest town by population in the country, so I’m told, Framingham MA. Being a contractor by trade, and seeing the building industry continuously slip, I decided it was the time to go back to college to get my bachelors degree. I chose Geography with a concentration in urban and regional planning at Framingham State University in the hopes of becoming a town planner. With my first season as an AM2 golfer under my belt, and many hours in course maintenance and even a redesign effort in Pelham NH, I know what it takes to make a reasonable course design. Having become a NEFA gold member this season I plan on playing a little less and concentrating more on school and getting a course in the ground so I can play local. I had never heard of GIS (geographic information systems,) a computer-based cartographic science that allows you to layer information from spreadsheet form to geographic space. It translated into me mapping a prospective course in an underutilized wooded area behind the high school; currently used for less than virtuous activities of young miscreants. A required final project and presentation by my classmate Sebastian and I, allowed us to show statistically why a course in this area of the state is so badly needed based on population. Regardless of whether this exact area is used for a course or whether one of several other recommended areas are used, a course is badly needed in MetroWest Massachusetts. Having personally been in touch with a number of town officials, the interest level is apparent for a free to the public activity, and locals are intrigued by the thought of a course in town. Using this GIS power point presentation as a base of basic information, along with a course proposal that is in the works, I would like to make a persuasive recommendation to the town in the near future at a town meeting. Here’s the proposed course layout! Thoughts, concerns, ideas, and especially experience of anyone in the disc golf community would be much appreciated in this endeavor, feel free to email me at discgolfguy22@gmail.com Answer the call of volunteerism, in the name of the sport that has given you and I so many countless hours of carefree enjoyment, please give your time and or your hard earned dollars until it hurts. This entry was posted in Course Highlights and tagged course, disc, framingham, golf, nefa, new. Bookmark the permalink. We would love to help by volunteering! So sick of driving as far as Worcester to play a little disc- it’s definitely needed in Framingham! Let us know if we can help! !